Increasing public transit between downtown Kansas City and SW Johnson County was discussed by county commissioners last week at a work session. At the transit study session Feb. 1, commissioners heard a presentation regarding the RideKC Smartmoves Transit and Mobility Plan. The mobility plan would build on existing bus service to LPKC in Edgerton. According to the study, an additional $300,000 would be needed for the SW Johnson County Connector annual cost. The program currently costs $345,000, and the total estimated cost for Monday-Saturday service would be $764,000. The balance of $38,000 would be covered by fare revenue. 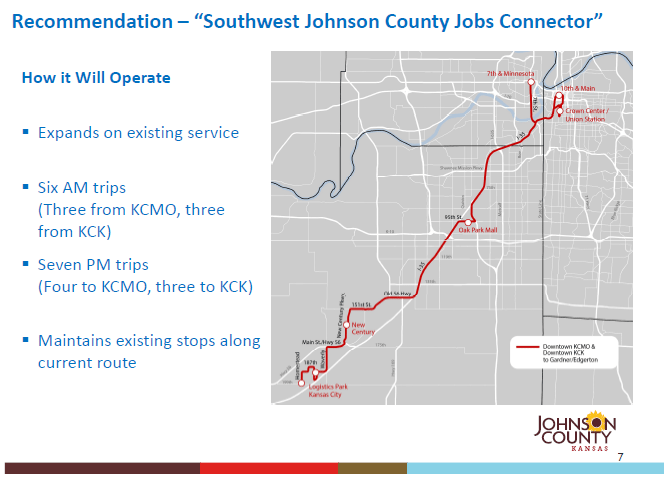 Success for the SW Johnson County Jobs Connector, if approved, would have the LPKC connected to new Century, KCK, KCMO and South KCMO. This success should increase stability in recruitment and retention efforts for employers; and create a positive employer response, assistance with marketing/public private partnerships; and pass programs. Goals would include 220 riders daily in the first year, more than 300 in the third year and 65 monthly pass holders to total $39,000. If approved, the plan is designed to: increase the number of jobs accessible by transit; increase ridership of transit and other mobility options; increase development along high-capacity corridors; and increase availability of customer information through technology. “It’s premature to say it will happen,” said Josh Powers, Johnson County business liaison. County staff worked with the MidAmerica Regional Council during 2017, and the plan will go to the commission for approval later this month. The idea is to get a jump on long range transportation, in part due to the uniqueness of the LPKC intermodal at Edgerton, Powers said. There are currently 7,000 jobs at the intermodal and long range plans indicate there may be 13-20,000 more in the next ten years. Transportation would link Edgerton to both Kansas City, Kan., and Kansas City, Mo. There would be six trips each day at $1.50 each way. Powers said there is a plan to work with employers to notify employees. Johnson County needs identified in the presentation included: More service focused on jobs recruitment and retention at growing employment centers such as the intermodal; Add evening and weekend service for nontraditional shifts; Improve transit option for vulnerable populations; Support economic growth with targeted transit-supportive development at activity centers and key corridors. Currently, there is limited existing service to Gardner-Edgerton; routes operate only during weekdays at peak hours between the intermodal and downtown Kansas City. If the plan is approved, existing service would be expanded on, with six AM trips and seven PM trips. Trips would be between KCMO and KCK. Existing stops would be maintained. “The Jo” merged with RideKC in 2015. The plan also discusses needs for expanded paratransit service for special populations and a proposed K10 Connector with the City of Lawrence.